In our annual pledge campaign, we are asked to demonstrate the stewardship of our treasure by pledging to the operating budget, and this is certainly a part of our planned giving. But there’s more to it: giving over and above that from the resources God has given us. And since we never know the moment when we will be called to join God, it is a good idea to have our own plan in place to return those resources to God. Immediate gifts such as cash, appreciated securities, real estate, personal property, etc. Deferred assets, usually transferred through wills and bequests or trusts. Life income gifts such as pooled income funds, charitable gift annuities, charitable remainder trusts and so forth. Life income gifts are usually designed to provide income to the donor while alive and revert to the charity after the donor’s passing, but provide the donor with a charitable deduction at the time of the donation. 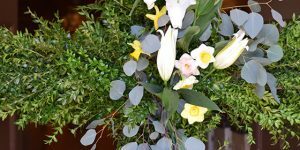 At Christmas and Easter, when we give memorial gifts to the Memorial Trust Fund or the General Endowment Fund, we are making a planned gift that will keep on giving long after the flowers are gone. This is one type of immediate planned giving, usually in the form of cash, but it could also be in the form of appreciated stock or other asset. While donating cash provides a gift that is deductible from our income taxes for those who itemize deductions, donating appreciated stock or other assets has an added benefit. Generally, the value of the stock at the time of donation may be claimed as a charitable deduction; this will eliminate having to pay capital gains tax on the appreciated value. As tax laws are complicated and change often, it is important to check with our financial advisor, accountant or lawyer to be certain. Another form of giving for St. Georgians who are over 70 ½ years of age and have provided for our retirement with an IRA is called a charitable IRA distribution. And for those who are under this age, you should think of this in your overall planning – or perhaps you have a parent or friend who could benefit from a charitable IRA distribution. As you may know, the IRS requires an individual to begin making a withdrawal from an IRA at age 70 ½. The amount that must be withdrawn each year is based upon the value of the IRA on December 31 of the prior year and the individual’s age. This is called the required minimum withdrawal or RMD for short, which usually results in a sudden increase in taxable income. In order for this to be counted as a charitable IRA distribution, the distribution must be made directly from the IRA to the charitable organization; that is, the individual should not withdraw the funds from the IRA and then donate to the charity. Usually the broker or other organization that holds the IRA funds will have a special form for this type of distribution. Check with them or your financial advisor. These are a popular form of gift for donors who want to receive a guaranteed fixed income while they are living. A gift annuity is a contract between the donor and an organization such as the Episcopal Church Foundation (ECF). The charitable gift annuity provider promises to pay a fixed annuity income to the donor for the rest of the donor’s life. To preserve the principal of the annuity, its payout rate is based upon the donor’s age and life expectancy. The donor receives a tax deduction for the present value of the remainder interest based upon a set of tables calculated by the American Council on Gift Annuities. The donor receives the same annuity payment for the donor’s life regardless of interest rates, investment strategy or economic trends. When the income beneficiary dies, the annuity provider releases the remaining funds in the account to the church or other charitable entity that the donor designated. For example, a former parishioner of St. George’s had set up a charitable gift annuity with the ECF. The parishioner received income while alive and St. George’s received the remainder in the account at the time of the parishioner’s death. Remember, we are merely stewards of God’s gifts to us, and we need to return them to God sooner or later. We encourage you to consider planned giving to supplement your annual pledge to the operating fund. Your gifts will not only help St. George’s but also provide you benefits by lowering your taxes. For further information about stewardship and planned giving, contact Joe+ or Ralph. Another source of information is the Episcopal Church Foundation, which has a variety of pamphlets and booklets.